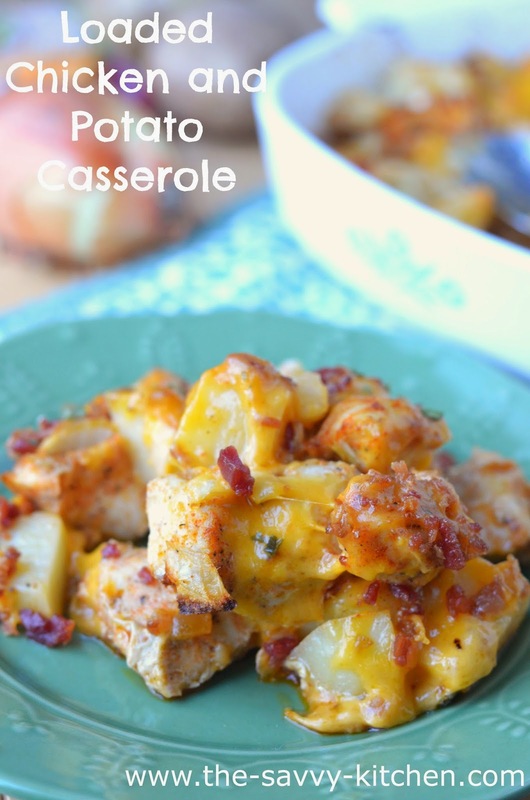 This is easily going to be one of my new favorite casseroles. I literally threw everything into one dish and let it bake. I ended up with a casserole that tasted like a loaded baked potato, but had chunks of seasoned chicken mixed in for extra protein. 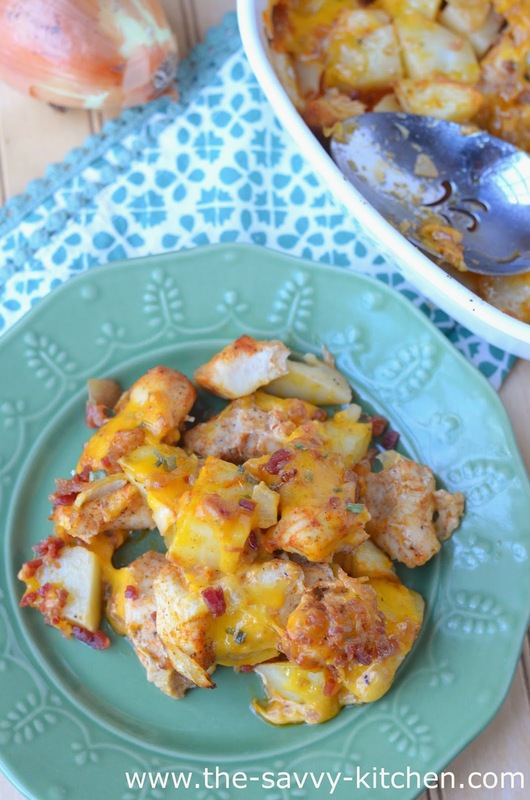 Chicken, potatoes, onion, cheese, bacon. What more could you want? A simple paprika and garlic powder combination gave the chicken and potatoes a ton of flavor. It also made the house smell ah-maz-ing. I love one pot meals since it's hard to cook with Bradley in the kitchen. He likes to be my sous chef, which is extremely adorable, but is also a hindrance when trying to cook. It's hard cooking with a baby on my hip! So I put this together while he napped and my dinner prep was done. So easy and so, so delicious. Enjoy! Preheat oven to 400 degrees F. Spray a 9×13-inch baking dish with non-stick spray. Spread the chicken, potato and onion pieces evenly into the baking dish. In a large bowl, whisk together the olive oil, paprika, garlic powder, salt and pepper. Pour mixture evenly over the chicken, potatoes and onions. Stir to coat the chicken, potatoes and onions. Bake, uncovered, for 50 to 55 minutes. 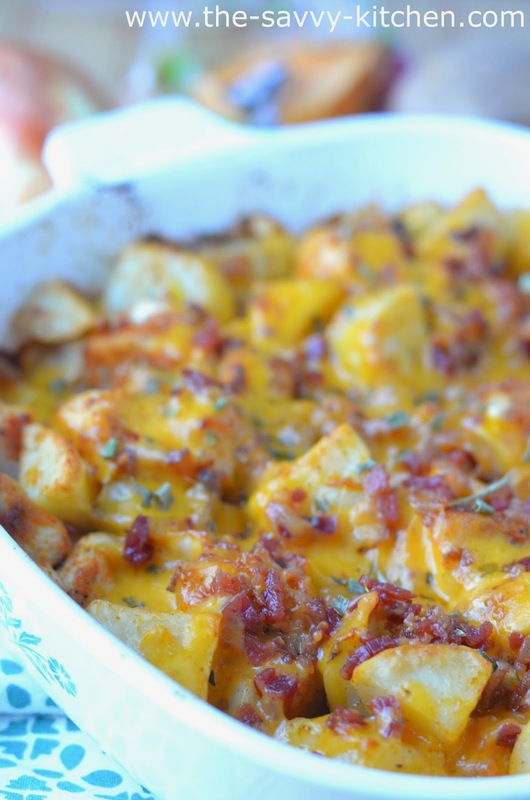 Remove from oven, and sprinkle evenly with the cheddar cheese and chopped bacon. Bake another 5 minutes, or until cheese is melted. Let stand 5 minutes before serving. Garish with scallions, if desired.